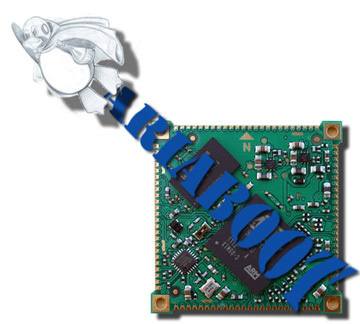 AriaBoot is a tiny bootloader located on the first FAT32 partition of the bootable SD card that is devoted to setup the Aria G25 hardware and load the Linux Kernel uImage saved on the same first partition. Note: Use AriaBoot with Linux Kernel 2.6.39. If you are using the Linux Kernel 3.11 or higher please use AT91Bootstrap. AriaBoot is a fork of the Atmel (c) AT91Bootstrap 5 series version 1.2. It must be stored in the first FAT32 partition of the bootable SD card with the name boot.bin. This is a special file name that RomBOOT searchs at start up on the SD card. RomBOOT is the very first piece of code launched by the CPU after reset and burned directly inside the CPU ROM. RomBOOT loads boot.ini (aka AriaBoot) inside the 32KB of RAM located inside the CPU itself called SRAM and runs it from there. AriaBoot initializates the DDR2 RAM (the main 128 or 256 MBytes RAM memory) and the CPU internal peripherals then tries to load the Linux Kernel uImage from microSD to the DDR2 RAM and runs it from there. AriaBoot read also another file called macaddr.txt contains the MAC address for the Aria G25 ethernet port. Acme Systems will set it on each microSD delivered but you can change it as you like. FAQ: Is this MAC address unique ? The MAC address saved by Acme Systems on the bootable micro SD or the binary repository images belongs to an Atmel pool of MAC address because the first 3 digits are from the Atmel IEEE MAC pool registrered on the IEEE Registration Authority so other devices based on Atmel CPU could have the same MAC. If you create a stand-alone program with this toolchain and store the executable on a file called userapp.bin on the SD card deleting the Linux uImage file, it will be loaded and executed by AriaBoot at the startup instead of Linux image. contains AriaBoot. Rename it in boot.bin and save it on the first microSD partition of your AriaG25. Inside the .config file it is possible to change some parameters. The most importat probably is CONFIG_LINUX_KERNEL_ARG_STRING which contains the command line arguments used by the Linux Kernel. "mem=128M console=ttyS0,115200 noinitrd root=/dev/mmcblk0p2 rw rootwait init=/sbin/init"
"mem=256M console=ttyS0,115200 noinitrd root=/dev/mmcblk0p2 rw rootwait init=/sbin/init"